Israel provides Hamas with steel and cement - despite ample evidence that it is already being slated for more terror tunnels. Israel began transporting construction materials into Gaza on Tuesday, in a "humanitarian gesture" to the Hamas-controlled territory which may be already rebuilding terror tunnels into the Jewish state. The "aid" includes 600 tons of cement, 50 truckloads of aggregate and 10 truckloads of steel. The office of the Coordinator of Government Activities in the Territories (COGAT) stated that the transfer is being conducted under the supervision of the UN and PA, as agreed with COGAT, General Yoav Mordechai. "This method [of transfer] is designed to ensure that the construction materials will be used to renovate homes and public buildings for the benefit of the people of Gaza, while maintaining Israel's security," the IDF stated, noting it would "carried out under UN supervision." Agricultural exports from Gaza will be allowed as well over the coming weeks, beginning with about 15 tons of dates and sweet potatoes due to be shipped to the PA.
Hamas regularly uses UN and other aid money, as well as materials, to build terror tunnels into Israeli territory with the aim of attacking Israeli citizens - instead of providing buildings to its own citizens. 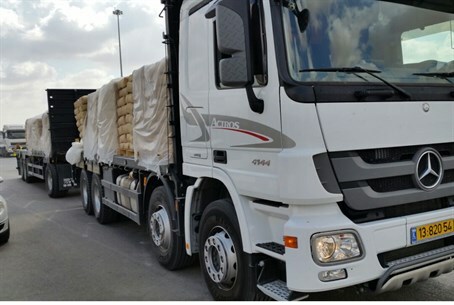 To illustrate this, the IDF revealed during the course of Operation Protective Edge that 4,680 trucks carrying 181 thousand tons of gravel, iron, cement, wood and other supplies have passed through the Kerem Shalom crossing into Gaza since January 2014 - much of it directly from Israel to fund civilian projects. Instead, however, a network of over 30 tunnels was found during the ground offensive, with each tunnel costing roughly $3 million to build. In every Hamas terror tunnel, the IDF stated, there were enough building materials to build 86 homes; seven mosques; six schools; or nineteen medical clinics. Evidence surfaced weeks ago that Hamas has already begun to rebuild these tunnels despite the IDF's pummeling the region during Operation Protective Edge - a reconstruction many fear will only accelerate after the UN and international donors pledged $5.4 billion earlier this week for Gaza.